In case you missed it, Wheel:Life would like to share our top ten stories from 2015. These crowd favorites are must-reads on accessible travel, wheelchair living and helpful topics that you won’t want to miss out on. Click any title below to enjoy the story of your choosing. If you’re one of the many individuals that wear a leg bag, then you’ll understand the complications that often come along with it. This can mean unexpected leaks, embarrassing situations, and other inconveniences. Here, we will show you how to be discreet while wearing a leg bag, avoid embarrassing situations, and most of all be more independent. Margarita Elizondo, a paralyzed mom of three, learned through her injury how to be less focused on herself, and how to instead focus on helping others. Healing comes from putting others before yourself, which is exactly what Margarita has done. Learn how she survived being shot, learned life lessons from others, and ultimately changed the way she lived her life. Hop online to find a group of friends who use wheelchairs near you! Being a part of a community is crucial, especially if you’re newly injured. Peer support can go a long way in helping you become more involved and discover the new you. Adjusting to a wheelchair can be challenging, which is why we encourage others to find a peer support group that you can relate to, will encourage you, and be there for you. There’s a lot to consider when purchasing the right custom wheelchair, and there’s more to picking out a wheelchair than just deciding on a color. It’s important that you find a chair that will accommodate your lifestyle. If you’re an active person, then you’re going to want a wheelchair that is compatible with the outdoors, meaning you’ll need a certain type of tires that have great durability and dependable traction. You’ll also need to explore the positives and negatives of using a rigid chair verses a folding one. This article will show you the 5 most important considerations when buying a custom chair. Who says you can’t have fabulous style because you’re in a wheelchair? Stephanie Thomas of Los Angeles, California believes you can rock the latest fashion with her line of clothing for people with disabilities. Like many others who use a wheelchair, Stephanie saw the lack of clothing options for these individuals and decided to do something about it, curating her own clothing that was accessible, smart, and in fashion. Kevin Polish has been shooting archery since the age of 3, he has won 14 World Championships, and he holds 13 out of 18 archery world records. Kevin is also an avid bow hunter, participates in competitive bowfishing and is preparing to re-launch his archery career in the 2016 tournament archery season. However, what many don’t know is that Kevin does all this from his wheelchair. Read about Kevin’s incredible journey to success. Once referred to as the “paralyzed bride,” after becoming paralyzed at her bachelorette party, Rachelle Friedman is now an active mother who happens to use a wheelchair. She constantly faces challenges such as changing diapers with limited hand dexterity and changing her baby’s clothes. But, despite these challenges, Friedman continues to seek out solutions to making life easier, using her resourcefulness as an advantage, and she does it all with style and grace. As a wheelchair user, you may have questions about sexual issues that you’re too embarrassed to ask, such as “will I be able to have children?” That’s why in this article, we explore various questions and answers for these issues with wheelchair user and clinical expert Dr. Mitchell Tepper. Wheel:Life Publications center on sharing resources and support for people who use wheelchairs. 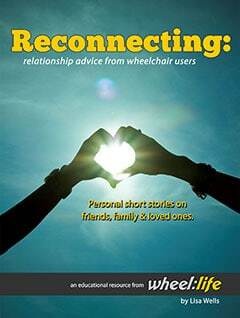 This is why Wheel:Life has published Reconnecting: Relationship Advice from Wheelchair Users. This book has advice from wheelchair users about reconnecting with others, whether it’s through dating, adoption, non-profits, adaptive sports, or parenting. 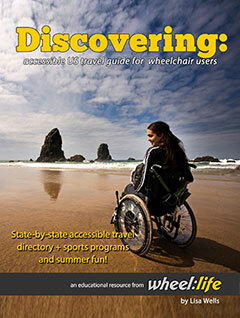 As a part of our annual Get Out & Enjoy Life (GOEL) program, we gathered accessible travel suggestions and created a state-by-state guide that will encourage you to explore all kinds of travel destinations across the United States. This is a book you’ll want to have the next time you’re planning a vacation or family get away.